Please vaccinate your children, and vaccinate them on time. Measles has begun spreading again due to what is called the “anti-vax” movement. In a country where some of the best healthcare is available, the spread of such a deadly disease is absolutely unacceptable. One of the main proponents of the anti-vaccine movement is that vaccines cause autism. Here’s some historical perspective: In 1998, Andrew Wakefield published a fraudulent study showing a correlation between the mumps, measles and rubella (MMR) vaccines and autism. After numerous investigations, it was found that Wakefield had a number of conflicts of interest, had manipulated evidence, and had broken a number of ethical codes. Multiple studies were conducted afterwards by organizations such as the Centers for Disease Control and Prevention, the American Academy of Pediatrics and the Institute of Medicine of the U.S. National Academy of Sciences, and they all showed that there is indeed no connection to the MMR vaccine and autism. Even the autism advocacy group Autism Speaks has stated that there is no connection to vaccination and autism. Any information telling you as such is completely false. Another major factor of the anti-vax movement concerns the materials used when making vaccinations, and that they will actually make you more sick than the diseases that they are supposed to prevent. These vaccine ingredients include a small amount of the disease so the body can become immune to it, aluminum salts, which improve the body’s response to the vaccine, and formaldehyde, which is originally in the vaccine to kill the germs or toxins used and then removed. Any trace amounts left over will not harm the child. Thimerosal is another hotly debated ingredient, because it is a preservative that contains mercury. The preservative was removed in 1999 due to the antivaxxers fear of vaccines causing autism, but multiple studies before its removal debunked the myth. It should also be noted that the number of recorded autism cases are still going up, even with the removal of thimerosal. 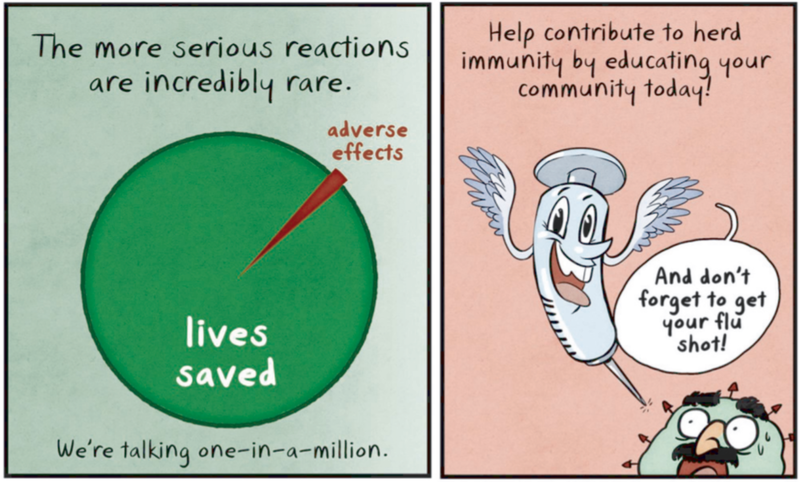 Herd immunity is a huge player in why vaccines work. If everyone in a particular area is vaccinated from a disease, then that disease cannot infiltrate and effect those people. This is especially important when there are children in the community who cannot be vaccinated due to other health concerns. If everyone else is safe, that protects the unvaccinated child. The problem begins when people willingly take their children off a vaccination schedule. Those children are no longer able to fight off the disease, which decreases the effectiveness of herd immunity. That’s why measles has been breaking out again, even though it was all but eradicated. That’s why it’s so important to vaccinate your kids—it’s not just for them, but for your community. To put it bluntly, would you rather have an autistic child, or one who died from a completely preventable disease? Your child, while very loved and probably very cute, is no more special than anyone else’s. They are not a special snowflake who needs to be protected from any possible dangers of vaccines as well as the diseases they prevent. If you are taking your child off their immunization schedule, then you are defeating the purpose of herd immunity and directly contributing to the problem. Vaccines do not cause autism. They are meant to protect you, your child and your community. Stop spreading the lies. Start doing research.